Hairline Restoration with Dr. Robert Haber of Beachwood and Mentor, Ohio. Hairline restoration is by far and away THE most important aspect of any hair transplant procedure that requires it. It will make or break the result each and every time without exception. The hairline is front and center just above the face and even a disinterested observer will instantly pick up flaws consciously or unconsciously in just one casual glance. Don’t believe that ? Well, next time you see two people meeting for the first time notice where their eyes go in the first 10 seconds of the meeting. Invariably they will go to the hairline of the other person. The thinner or higher the hairline, the more the other person’s eyes will be attracted back to it over and over again like a magnet. Recognizing this reality Dr. Robert Haber, a hair transplant expert with offices in Ohio, has tailored his hairline restoration procedures to include the implantation of massive amounts of single hair grafts tightly packed in the hairlines of his patients. This technique is by far the most challenging for both him as the surgeon and his team of experienced technicians but produces the most consistently successful results. No other procedure known to man can produce these results. Take one of his patients seen in the photo below. Look how unbalanced his hair looks in the before photo (left). 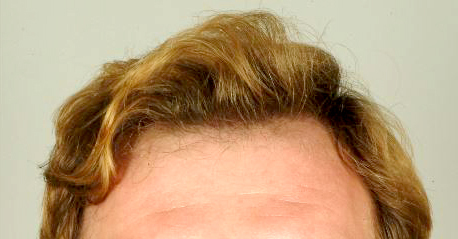 He has puffy hair on the sides, but the front and top are flat with dying hairs laying limply on a bald scalp. There is no hairline to speak of. In the After photo (right) you can see a well defined hairline but also noticed that his overall hair style is now balanced. He still has puffy hair on the sides, in fact it is identical to the before photo, but look at how puffy the front and top are now. He is properly balanced and thus nothing stands out to the casual observer as odd or off. This is the power of a properly performed hair transplant and meticulous hairline restoration work. Also notice that Dr. Haber did not attempt to recreate the hairline his patient had in his twenties. Rather, he matched the hairline to the existing hair and took into account the fact that this young man will age and continue to lose some hair BEHIND his transplants in the future. By doing this his hairline will always look age appropriate and blend in naturally. 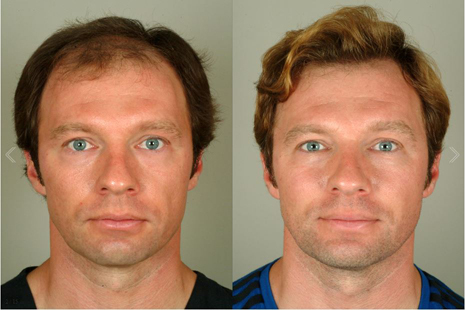 It is this kind of surgery and result that has made hair transplant surgery one of the most popular and successful cosmetic surgeries in the world; and patients like him have incredibly skilled and expert doctors like Dr. Haber to thank for it.